Learn when not to use apostrophes. Few mistakes send grammar snobs into a tizzy like misused apostrophes. It’s not hard to learn the apostrophe rules, and it’s worth the trouble just to avoid the grief you’ll get when you goof it up. Apostrophes are used to mark missing letters in contractions and to show possession in nouns. That’s it. 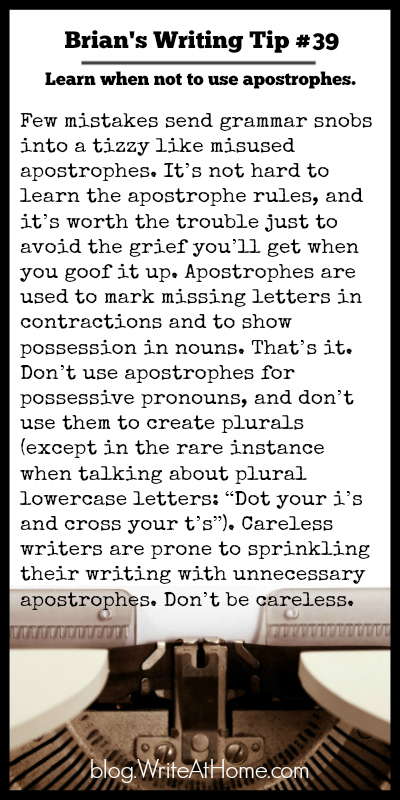 Don’t use apostrophes for possessive pronouns, and don’t use them to create plurals (except in the rare instance when talking about plural lowercase letters: “Dot your i’s and cross your t’s”). Careless writers are prone to sprinkling their writing with unnecessary apostrophes. Don’t be careless. As always, I value your comments. Leave them below! What about usage of apostrophe with “it”, as in the case of possessive versus the contraction of “it is”. Is an apostrophe used in both cases?